Read at least 10 Books This Summer & Celebrate In September! Sundae Monday Celebration is September 9! All Bobcats need to read every day during the summer! We are going to celebrate that reading in the Benfer Library at our first Sundae Monday Celebration! We will make our own ice cream sundaes and talk about the great books we read! Keep track of your summer reading, & complete some fun activities this summer! Get your Sundae Monday Celebration invitation when you turn in your reading log to the Benfer Library! Visit the Benfer Summer Reading Page if you need a reading log! 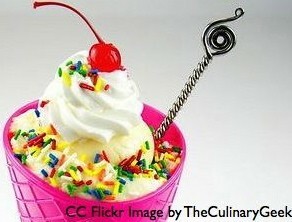 Trade your Slide Into Summer Reading Log for an invitation to the Sundae Monday Celebration! Turn in your Reading Log to the Benfer Library by Wednesday, September 4!